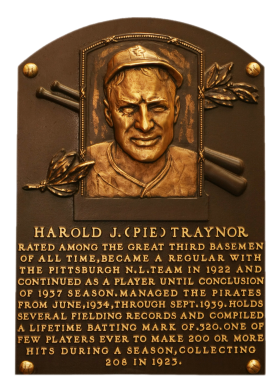 Pie Traynor earned his way into the Hall of Fame as the best fielding third baseman of his era. A career .320 hitter for Pittsburgh, he hit .300 or better 10 times and had more than 100 RBI seven times. He was selected in 1969 as a member of the all-time team for baseball's centennial. Pie had 1,273 career RBI and 1,183 runs. Comments: The Traynor story begins with a 1980 TCMA #102 tribute card I purchased raw on eBay. It was graded MINT 9 by PSA in 2002 and served as a placeholder until I could find a contemporary issue. 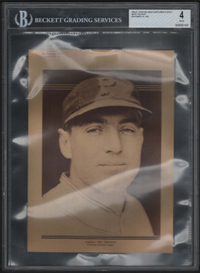 In April, 2005 I acquired a raw 1923 V117 Maple Crispette card from 2737. It was in rough shape but still submitted to PSA. In March, 2007 I found a 1926 M101-7 supplement in VG condition while browsing eBay and won the auction. It was a great portrait of Pie and perfect for the collection. 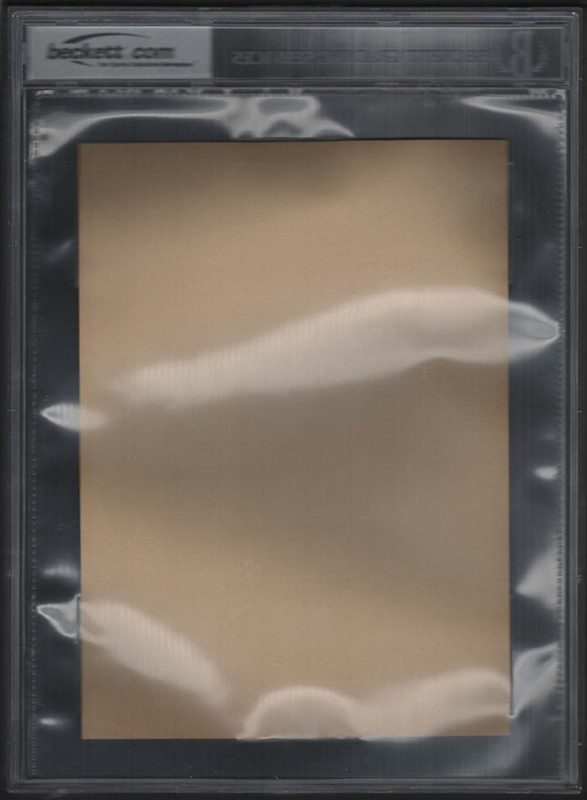 Neither SGC or PSA graded supplements so it stayed in it’s toploader for several years. I found another raw supplement, which appeared to be NM, at The National in 2014 from E&R Galleries (Ron Vitro) and submitted it onsite to Beckett. They’re so fragile, paper thin, and the edges tend to fray. Upon handing it over to the guys at the booth, I accidentally put a small surface wrinkle in it when I mishandled the item while placing it back into the toploader. CRAP! It came back graded VG-EX. UPDATE: There’s been a nice Traynor M101-7 on eBay for a couple years now and I made a couple offers. The seller wanted $150. In August, 2015 they finally agreed with me at $85. I should have it in my hands soon. Hopefully, this one will grade out better than VG-EX and help me forget about my folly at the 2014 National. That card was very nice before I messed it up. Hopefully, this one is just as perfect. Description: This set of 11 player photos was issued as a post-World Series weekly supplement by the Sporting News in 1926. 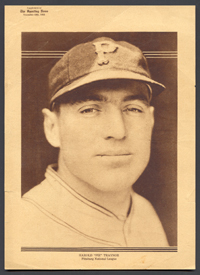 Sepia-toned portrait of posed photos are featured on the 7" X 10" supplements. The player's name and team are printed at the bottom, while a line identifying The Sporting News and the date appear in upper left corner. The unnumbered set includes a half-dozen Hall of Famers. A large-format (10" X 14") team photo of the 1926 Yankees was issued Oct. 28, 1926, a week preceding the start of issue for these weekly supplments.